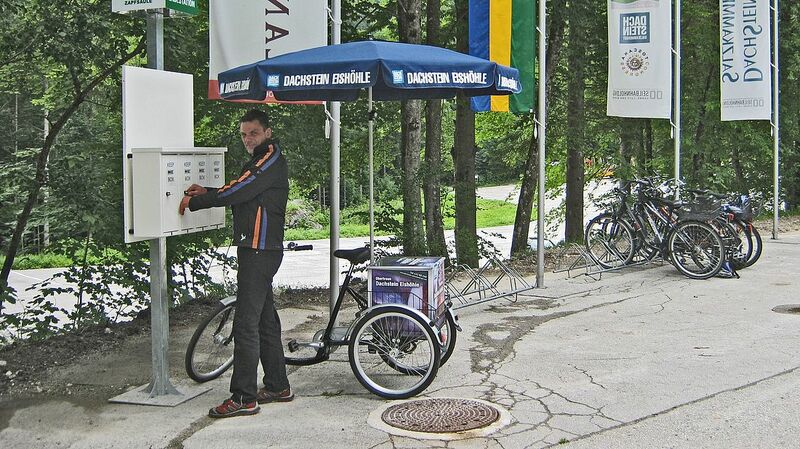 For all E-Bike riders there is a free charging station for E-Bikes at the valley station for the Dachstein-Krippenstein cable car! The E-charging station is located at the valley station, right next to the ticket office and it is signposted. While E-Bike batteries are charged free of charge at the E-charging station, you get to investigate the subterranean mountainscape of the Dachstein Ice Caves, the Koppenbrüllerhöhle cave and Mammuthöhle cave; enjoy the fantastic mountains in Dachstein in the Salzkammergut or just relax on the mountain and replenish your own energy stores for the return leg of your trip! Note: The E-charging station has four safety plugs with child protection feature and water protection.